Nearly $1 billion in taxpayer money has already been spent by the United States military to develop next-generation microchips that are powerful enough to animate killer artificial intelligence (AI) robots, new reports indicate. A hefty sum of $900 million, to be more precise, is the exact figure that government officials have announced is being “invested” into developing advanced materials and technologies to power the military’s army of metal machines that will presumably be used to enforce the coming new world order. According to reports, the Defense Advanced Research Projects Agency, also known as DARPA, is calling the plan the “Electronics Resurgence Initiative” (ERI). Under the ERI, six new programs will be created over the next four years to make the government’s pipe dream of unleashing an AI-controlled world a reality. One of these programs will focus on ensuring that the predictions made by Moore’s Law, which is said to govern the projected increases in microchip processing power over time, become a reality. Three other areas will focus on materials and integration, circuit design, and systems architecture. Something to the tune of $75 million will be spent each year by the government towards these ends. “Moore’s Law has set the technology community on a quest for continued scaling and those who have mastered the technology to date have enjoyed the greatest commercial benefits and the greatest gains in defense capabilities,” says Bill Chappell, director of the agency’s Microsystems Technology Office, about the nature of Moore’s Law, which has set the standard for the electronics industry for more than half a century. It might all sound like some kind of creepy new script for the next Terminator movie as opposed to the blueprints for a new American (and eventually global) society. 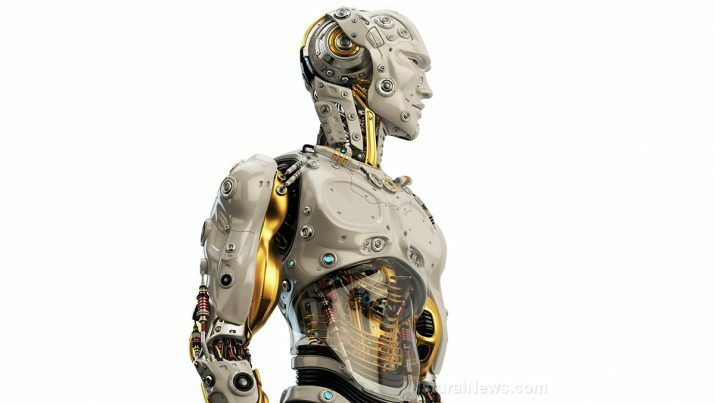 But the truth of the matter is that there are unspeakably dark elements that have embedded themselves within the government that are hellbent on making killer AI robots an eventual reality – and they plan to use YOUR tax dollars to do it. Do not forget that Apple co-founder Steve Wozniak announced back in 2015 that AI robots would eventually be introduced that would turn humans into their “pets.” This is the same Apple corporation, of course, that, with each new reveal of the latest iPhone, integrates more and more of this type of AI technology into people’s smartphones. To go along with its endgame of achieving total human genocide through technology, the U.S. military also announced back in June a plan to develop a new “brain chip” that human beings will one day be given that will allow them “to simply plug into a computer.” The idea of this heinous implant is already being soft-sold with claims that it will help to “treat” things like blindness, paralysis, and speech impediments. Let that sink in for a moment and consider the fact that the long-term implications of merging humans with machines is the complete eradication of humanity in its natural form. Is this the type of reality in which you want to live?